If you're a horse owner, you know that equine gastrointestinal issues are a veterinary red alert. Although your horse might pass some loose manure after a change of hay or feed, that's fairly common and it should firm up soon. If your horse experiences moderate to severe diarrhea, he has colitis, so you need to get your vet out pronto. 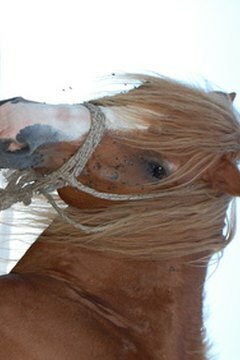 Colitis is inflammation of your horse's large intestine, the colon. When the cecum is also involved, the technical term is typhlocolitis. As it progresses through the horse's digestive tract, it's known as enterocolitis if involving the small intestine and gastroenterocolitis if affecting the entire gastrointestinal tract. No matter what type of colitis your horse has, it's a potentially life-threatening condition. While your horse will have constant explosive diarrhea, the possibility exists that he'll go into shock. Early signs might resemble colic, as your horse isn't interested in eating and exhibiting abdominal pain. He's looking at his belly, restless, possibly laying down. However, if you've been through colic, you know how happy you are when your horse passes manure. With colitis, he's passing liquid volumes of it. He could also be feverish and breathing hard with a rapid heart rate. Check his gums -- his mucous membranes might appear bright red or purple. Without prompt treatment, your horse could founder. You know how sensitive horses are. Stress can bring on colitis, especially the stress of long-distance shipping. Other causes include abrupt dietary changes, which can cause good bacteria in the gut to die off. Always transition your horse gradually to new feeds, whether hay or grain. Bacteria and viruses can cause colitis, especially the rotavirus in foals. Watch your horse carefully if he's on butamine, better known as bute, a pain medication, or other nonsteroidal anti-inflammatory drugs. High doses of these can cause colon inflammation, resulting in colitis. Because your horse has lost so much liquid through diarrhea, it's important to keep him hydrated. Your vet will use IV fluids with electrolytes to do that. She'll also medicate your horse to control inflammation, and to get his blood pressure and heart rate back to normal. Other treatments depend on the cause of the condition. Because his digestive system is out of whack, your vet might filter manure from a healthy horse and tube it into your horse to get good probiotic bacteria into the gastrointestinal system. It can take days or weeks before your horse improves, so intensive nursing is necessary. Much depends on whether common complications such as laminitis ensue.